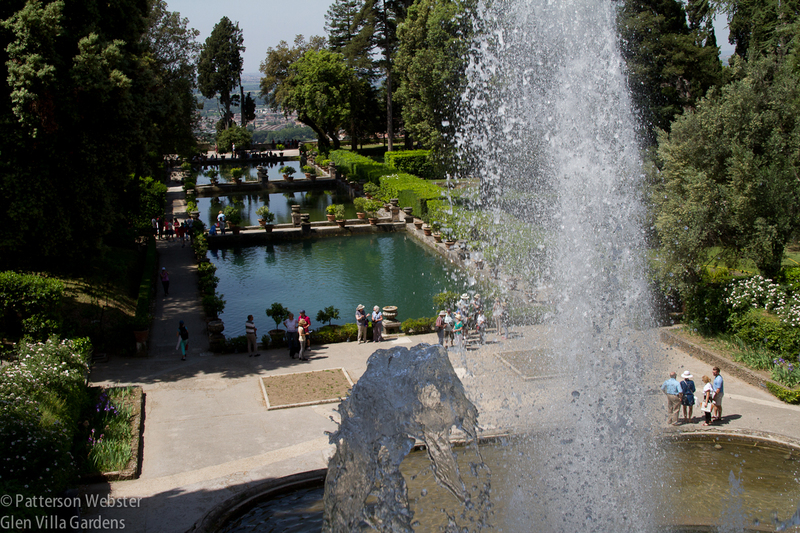 It’s a commonplace to say that a garden is different each time you see it, but my most recent visit to Villa d’Este at Tivoli confirmed that some truisms really are true: you can’t step in the same water twice. Not that I was stepping in water. 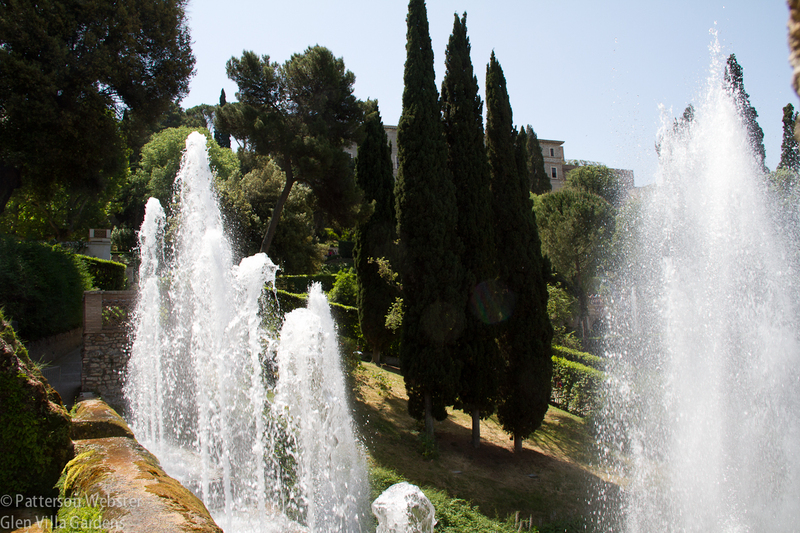 I was surrounded by it, however, since water in all its guises is the most memorable feature of Villa d’Este. 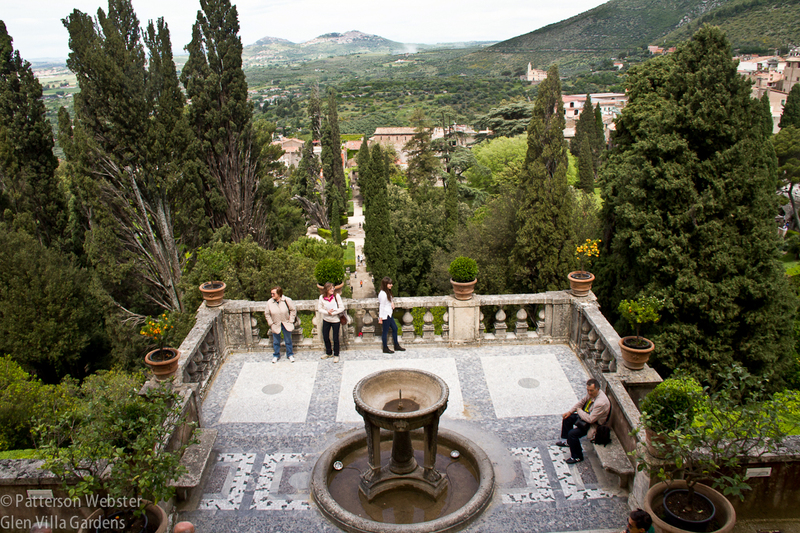 Constructed between 1550 – 1572, this garden exemplifies the High Renaissance style. Every inch of the site is ordered and symmetrical, everything is scaled to match the vastness of surrounding landscape – and yet the garden is walled off from it. The view down the central axis of Villa d’Este shows the town of Tivoli immediately outside the garden and the mountains in the distance beyond. The world created for Cardinal Ippolita d’Este may be held tightly within its walls but the references extend far beyond. Designed by Pirro Ligorio, the leading antiquarian of his generation, the garden is full of erudite allusions, reflecting the cult of antiquity which played so major a role in Italian Renaissance gardens. Unschooled as most of us now are in the intricacies of these allusions, their meanings escape us — unless we have a guide who points them out or we ourselves have read about and remembered their significance. 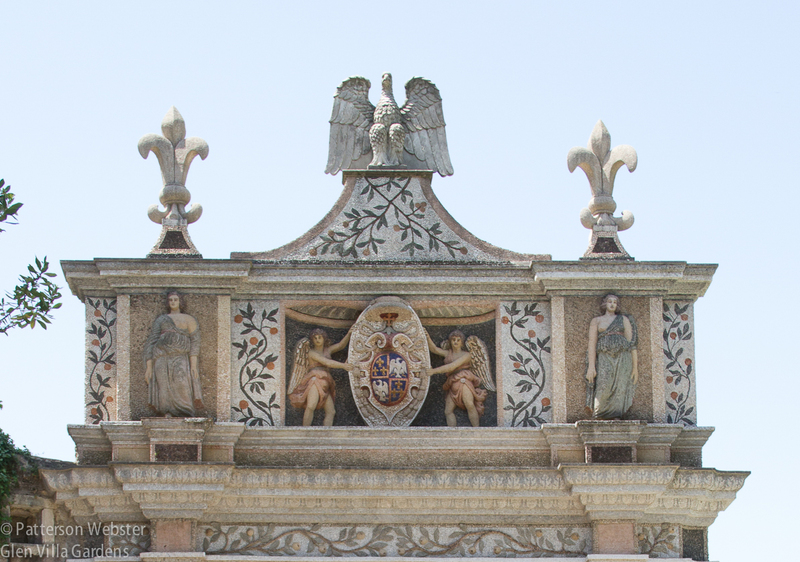 Some symbols once identified are unmistakable, like the d’Este eagle that flies high on many a pillar and post. 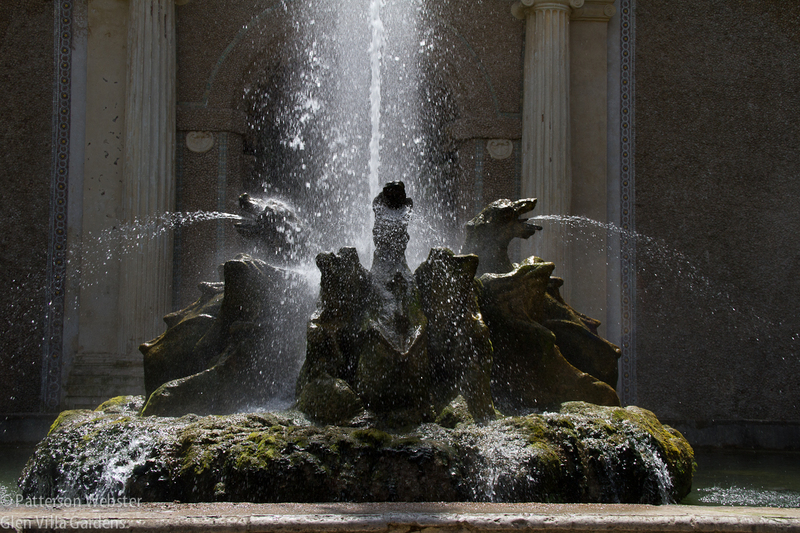 The eagle atop the Owl Fountain is one symbol of the powerful d’Este family. The fleur-de-lys is another. We don’t need to understand the references, though, to enjoy the spectacle. When water makes organs play (even if slightly off pitch), when it shoots to heights that rival the cypress trees growing nearby, when it roars in a grotto or whispers along a stone balustrade, amazement and pleasure are the happy results. Sprays of water rise into the air, mirroring in white the shape of the dark cypress beyond. 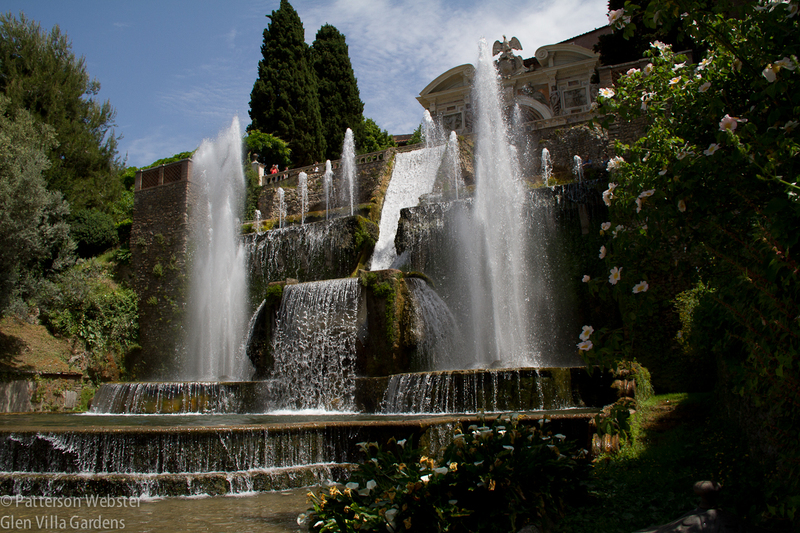 Undoubtedly the most photographed water feature at Villa d’Este is the Allée of a Hundred Fountains. (Apparently there are actually 200; not having counted, I can’t vouch for either number.) This water dance is situated on one of garden’s main cross-axes, an avenue 426 feet long. On three tiers, water symbolizing three local rivers rises, falls, sprays and spits. When newly built, each tier was as crisply edged as the recently renovated Organ Fountain; now moss and lady’s mantle cushion the edges with green. The Allée of a Hundred Fountains never fails to impress. The garden is laid out on a right-angled grid, divided into regular, geometrically-determined units, as were many gardens of the period. Unlike other sites, however, at Villa d’Este the central axis is not the sole governing feature, nor are the two sides of the central axis identical. Cross-paths appear throughout, and not as minor elements but as major paths that lead to the garden’s primary points of interest. 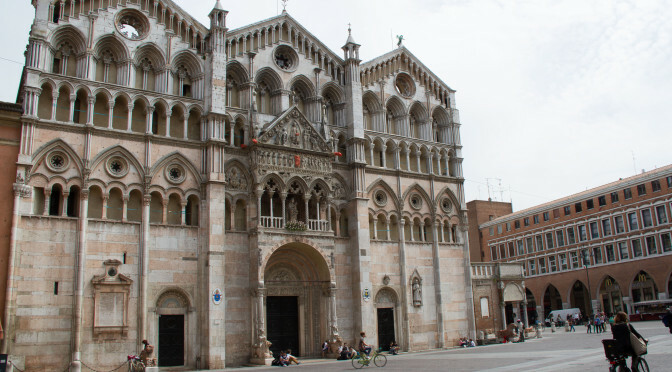 The bottom portion of the Organ Fountain stands at the end of a major cross axis. Notice the d’Este eagle silhouetted against the sky. The result is a layout that forces visitors to determine their own route. At every junction, you have to make a choice: shall I go this way or that? Being forced to choose shapes your experience of the garden. You are engaged with it directly, engaged spatially in a way that is impossible in uni-directional sites. Being forced to choose makes some people anxious. What will I miss if I turn right instead of left? Shall I go this way first and then retrace my steps? Hold on, let me consult my map. And suddenly, all attention goes to the printed page rather than to the extraordinary space that surrounds you. 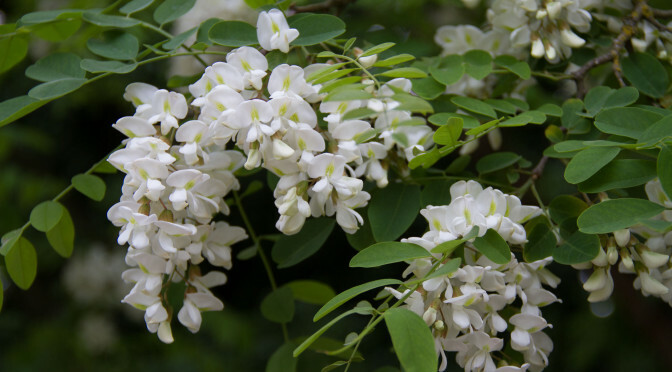 For those willing to let go of these anxieties and wander at will, the first visit to a garden can be magic. 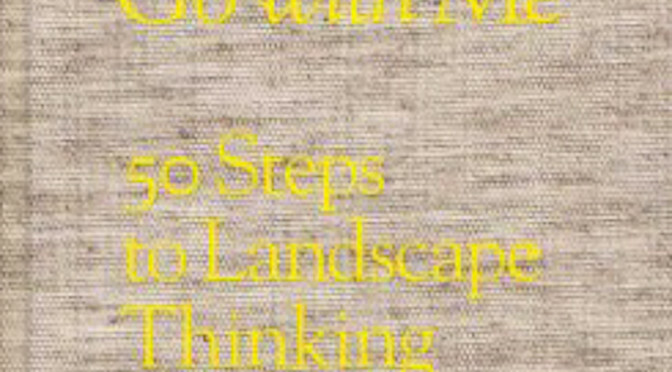 Exploring with no constraints, you experience the garden in your own way, at your own pace, in your own style. But not everyone is a wanderer, and not everyone is willing or able to let go. This is particularly difficult when you are part of a group. It’s even harder when you are the leader. 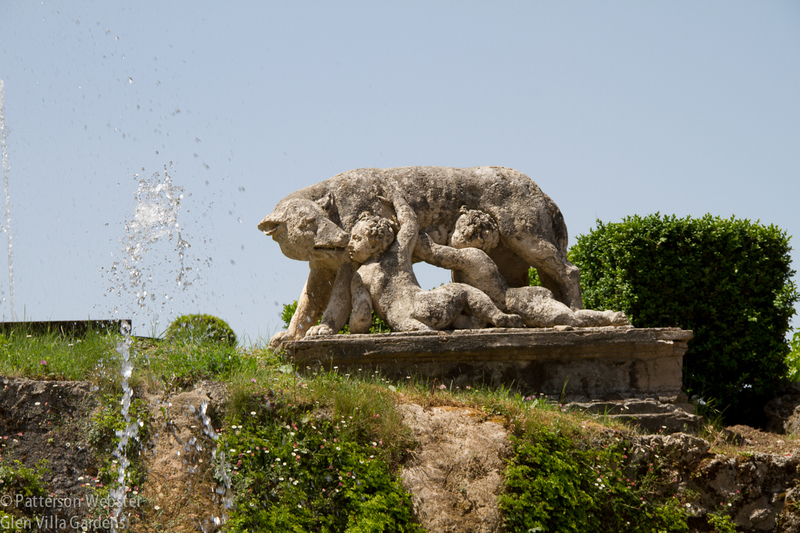 This statue of Romulus and Remus with the She-Wolf is in the Disney-like Rometta, a miniature representation of some of Rome’s landmarks. 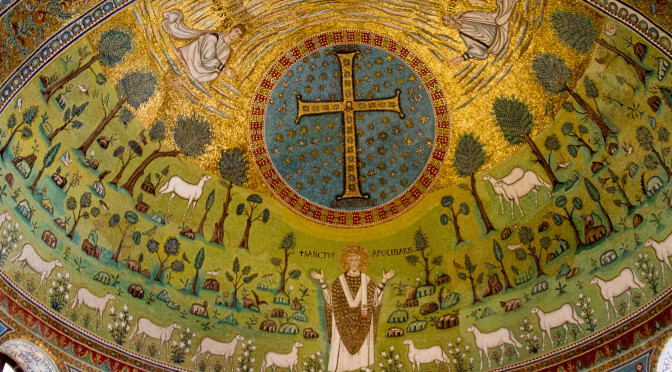 It stands at one end of a cross axis, in opposition to the Oval Fountain where an imposing Mount Parnassus appears, linking Cardinal d’Este and Tivoli to the source of creativity and, by implication, diminishing the importance of Rome. 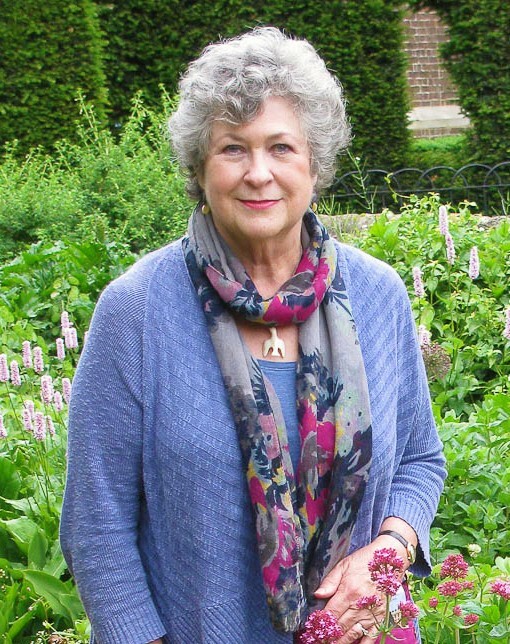 Visiting a garden with a guide can be a wonderfully enriching experience, but it does have its down side. 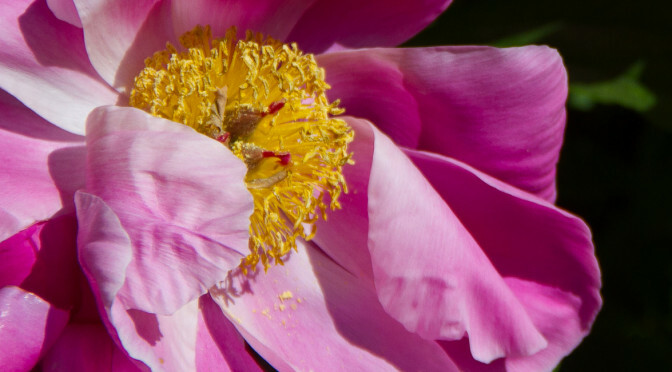 A guided tour of a garden eliminates both the need to choose and the freedom to experience the garden on your own. It can be a practical decision: you won’t waste time standing in line at the entry (a big factor at Villa d’Este), retracing your steps or wondering what lies along the other path, and you can learn a lot if you devote your attention to what the guide is saying. You learn facts from a guide, and if the guide is really good, those facts help you to understand the garden, its makers and its context. What you learn on your own is different. Or at least it can be. When I move through a garden on my own, I look more closely at what is in front of me, whether it is a plant, a fountain or a choice of routes. Focusing on what I see, I begin to form questions. Who are those figures holding up the columns? Why do the women have twisted legs? Where does the water come from, and where does it go? 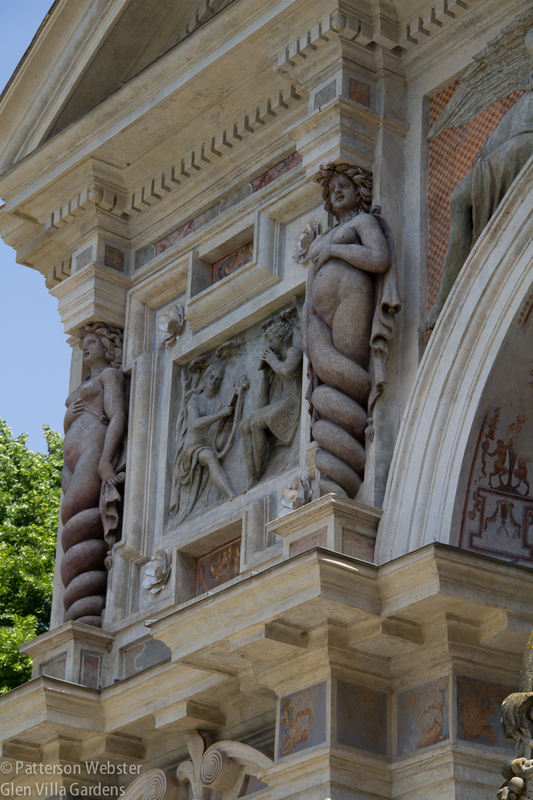 The twisted legs of these figures suggest a transition between animal and human being.. Metamorphosis and change are underlying themes of Villa d’Este. Villa d’Este is a garden that repays this kind of wandering. On my visit a few weeks ago, I saw a cat wandering along a shady path, avoiding noisy groups of schoolchildren. I tried to imagine how those children would have reacted to a music-playing fountain in the days before computer and piped music made such things ordinary. I admired how the still waters of the fish ponds provided a welcome rest from the constant exuberance of the fountains. Spray flying everywhere when a wind blows plays its own water tricks. I circled the Dragon Fountain, examining its features from every angle, then paused to consider the contradiction implied when dragons spout water instead of fire. I thought of the strange multi-breasted statue of Diana of Ephesus and remembered seeing the original in a museum long ago. Is this the multi-headed dragon Ladon who guarded the entrance to the Garden of the Hesperides, where golden apples were to be found? If so, I suggest that fire-breathing dragons would do a better job. 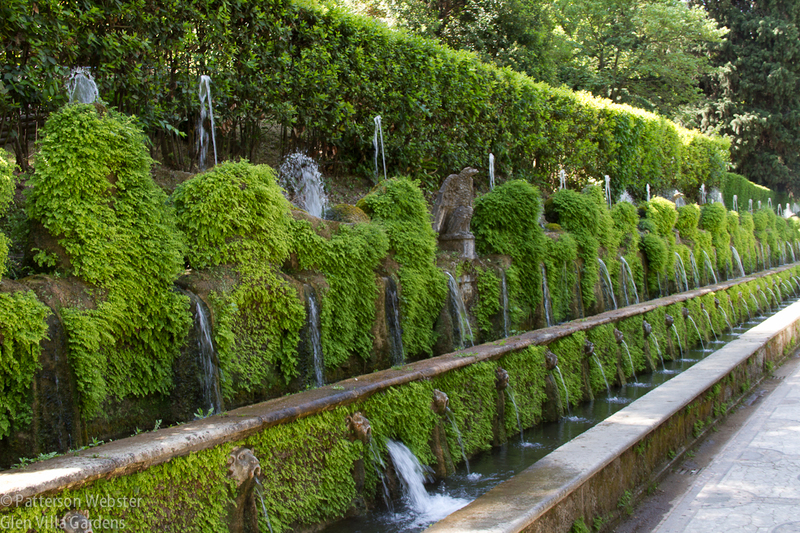 Villa d’Este is not a peaceful garden. The constantly moving water combined with the crowds that visit daily create a restlessness that is out of sync with current ideas of the garden as retreat. Yet that very restlessness is energizing. Seeing this garden I felt alive. I felt connected, to the spectacles of the past that surrounded me and to the present moment. Sometimes a garden may disappoint on a second or third viewing. Villa d’Este does not. Rather, it makes me wonder what I’ll experience and how I’ll respond the next time I’m there.